By Dan Spors and Kyle Dolbow, HealthFactors, Inc.
As patient-centered care and mHealth have become driving forces in health care, digitally connected health technologies have emerged as a solution to engage patients and collect data. Many of these technologies are geared toward patients with chronic and complex conditions, which account for 81 percent of all hospital admissions, 91 percent of prescriptions filled, and 76 percent of doctor visits. But patient and provider adoption of these devices can be a challenge. So how can connected technologies prove their worth and appeal to patient and physician needs? This goes beyond FDA validation. Health-care systems want technologies that patients and staff can use and understand. When people think about information and interactions associated with digital health, they may often think of security, privacy, and interoperability. Along with those highly important items, the FDA now considers real-world evidence a part of the review process for medical devices. Real-world results include data that demonstrate evidence of a product’s ability to improve outcomes and lower costs outside of a clinical research setting, or allow the same outcomes to be achieved in a more effective way. The ability to show that connected devices produce results for patients in real-world settings also increases the likelihood that health systems and patients will adopt the technology. And this, along with hard data about outcomes, ultimately provides the basis for reimbursement under value-based contracts. Evidence about patient adherence with prescribed care plans and medications can help reduce the incidence of costly complications and improve health outcomes. And that benefits everyone. For example, imagine the benefit of knowing not only how many times a patient with asthma or COPD (chronic obstructive pulmonary disease) used their inhaler, but how much of the medication was successfully received and when the medication was dispensed. This data can be used clinically to make a difference in follow-up care, lifestyle management, and patient support. What is the benefit of digitally connected programs to our organization? How do we systematically introduce connectedness into our products and services? What assets and resources are required to implement and support the connected health program? The answers to these questions may differ depending on whether the company is an established medical device manufacturer or a new company. According to the PwC Spotlight report, established companies traditionally emphasize clinical technology used by providers, with a recent shift into expanding beyond the device. New entrants into med-tech focus more on enabling clinical technology and at-home care, with services and broader solutions ingrained in the product. The report also shows that successful medical device companies share some significant characteristics: Five out of the top 10 offer customized solutions independent of their product offerings; seven out of 10 have undergone organizational changes reflecting a shift toward services-based offerings; and all 10 companies provide training and educational resources. All companies surveyed share a focus on patient-centricity and are focused on evolving payment models. The key to implementing connected solutions is to choose what you want to offer and establish the right partnerships. First, a medical device or life sciences company must decide whether to offer solutions or products. New companies are building consumer-centered services into their commercialization models, while established companies must examine the opportunities for value-based payment models prior to expanding their offerings. Those who choose not to focus on solutions should still include the customer or patient perspective in product designs. First and foremost is expertise about engaging patients and their care team. Patient engagement may be the single most important aspect of connected therapies. Second is a defined, battle-hardened process for strategy, design, and implementation. Discover the key patient and/or provider obstacles to success with implementing a specific therapy, and focus on minimizing the three to five most significant obstacles. Focus on an initial “minimally viable product” to start, and set about collecting real-world evidence. Third, implement your therapy program on a platform that is designed for the intricacies of connected care. The platform should be secure, private, and HIPPA compliant, at a minimum. It should include essential tools like device connectivity, flexible care plan configuration, and serious analytics. This will allow you to reach the pilot stage in short order (12 weeks), and with manageable cost. And finally, have a data strategy that identifies who needs what information, as well as how they receive and view it. This can be achieved through a platform that offers easy extensibility. Data from patients may include information on medication intake, care plan adherence, and therapy compliance. This data can identify if a patient struggles with a treatment, and enables clinicians and caregivers to take action. Because the data is remotely transmitted to clinicians, therapists, and parents or caregivers, they can adjust the patient’s technique (if needed) so they remain compliant and avoid complications. Collaborative efforts are underway – particularly in the realms of diabetes and COPD care – to develop the clinical and technology advancements needed to make the implementation of connected solutions part of mainstream clinical practice. As patients of all ages — especially the digital natives that make up the millennial population and generations to come — increasingly seek ways to involve their caregivers and personal support system into their ongoing treatment, connected solutions are sure to become a ubiquitous feature of our health-care system. 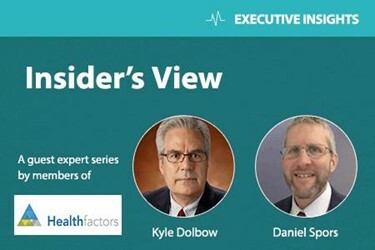 Daniel Spors is chief commercial officer for HealthFactors Inc. Dan was a founding member of HealthFactors and Preventice, and held staff and leadership positions at IBM, ShowCase Corporation, and Centerfield Technology. He received a B.S. in computer science and math from Winona State University. Kyle Dolbow is CEO at HealthFactors Inc. Prior to HealthFactors, Kyle was a pioneer at Preventice and served as president of Vree Health. He received a B.A. in chemistry from the College of Wooster, and completed his Ph.D. in chemistry at the Massachusetts Institute of Technology.